Two down … two to go. 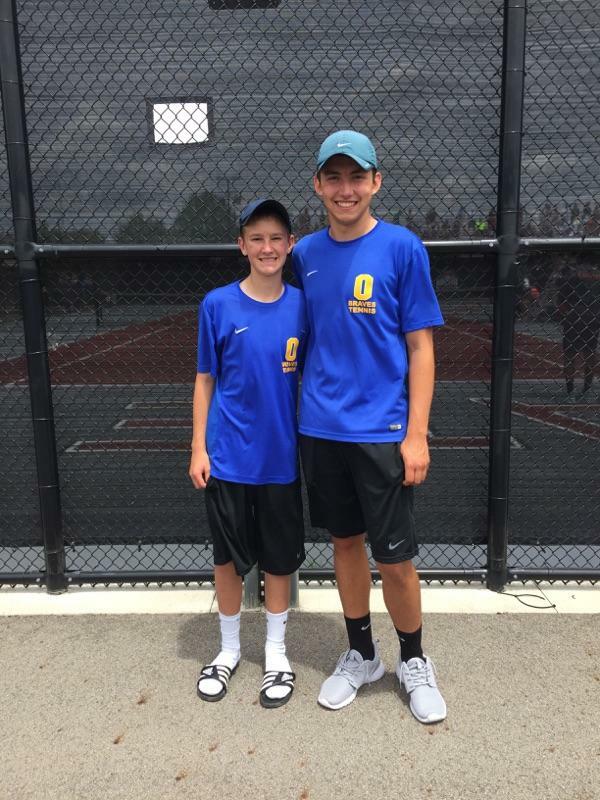 Olentangy senior Stu Brdicka was sharp Friday, winning his first- and second-round matches at the Division I Boys State Tennis Tournament to punch a ticket to today’s state semifinal at the Lindner Family Tennis Center in Mason. He’ll play Mason junior Niraj Komatineni for the right to compete for a state singles championship. Brdicka, the first Olentangy tennis player to reach the state semifinals, started the day with a 6-3, 6-2 win over Lakota East senior Chris Holden before knocking off Perrysburg senior Ben Weider 6-0, 6-3 to earn a spot in the final four. In D-I doubles action, Olentangy Orange’s Alex Heiden and Jordan Phelps won their opener over Toledo St. John’s Jesuit’s Alan Fahoury and Dev Laungani by a score of 6-4, 6-2, but fell to Sycamore’s Sam Marcus and Nathan Zhang 3-6, 6-4, 6-2 in the second round to see their solid seasons come to an end. 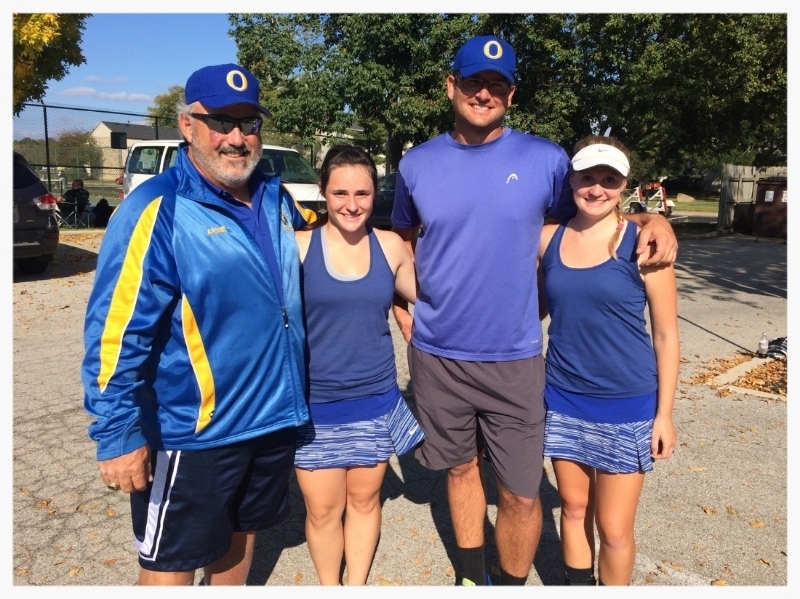 Bri and Kathleen made Olentangy history by becoming the first OHS team to qualify for the state tennis tournament. After a first-place finish at the sectional tournament, these ladies entered the district tournament as a one seed. They dominated their first two matches at Hilliard Davidson with wins over district qualifiers from Watterson and Dublin Jerome. On the second day of the district tournament, they fell to eventual state champions Berger/Jung from UA but then pulled out a huge three-set victory over eventual state fourth-place team James/Chang from Dublin Jerome to earn a three seed into the state tournament. At the state tournament at the Ohio State varsity tennis courts, a large contingent of Braves players and supporters came out on a gorgeous Friday to cheer Bri and Kathleen on to victory. Heading into a tough match-up with a two seed and a returning state qualifier from North Canton Hoover, the girls were cool and determined and came out on top with a decisive 6-3, 6-2 victory. Their run ended with a 6-4, 6-2 loss to returning state qualifiers and eventual third-place Toledo Notre Dame Academy, but they left it all out on the court and were still smiling at the end of their long day. Congratulations to Bri and Kathleen on their tremendous accomplishments, going 8-2 and finishing among the top 8 teams in the state, as well as to their parents and siblings for all of their support! Senior Kevin Miller and Freshman Stu Brdicka teamed up to make history for Braves Men's Tennis by becoming the first ever male players to make it to the State Tournament at Ohio State Univesity. Their signature win came against the St. Charles team at districts, where Kevin and Stu came back from 1-5 deficit in the third set to win in a tiebreaker. They advanced to play rivals from Olentangy Orange, who were no match for Kevin and Stu as they rode the momentum from the St. Charles win.